On Wednesday, Wayne County priced bonds through the Michigan Finance Authority, raising $315 million for a portion of the County’s $380 million contribution toward a new criminal justice center project on East Warren Avenue near I-75. The tax-exempt fixed rate bonds mature over 30 years with an interest rate of 3.91 percent. The pricing of the bonds followed investor meetings in Boston, Chicago, and New York City. As planned, the County will finance the criminal justice project through approximately $315 million in bond proceeds through the Michigan Finance Authority’s intercept program, which provides more security for investors by sending Michigan’s Distributable State Aid (revenue sharing) to a third-party trustee to service the debt. Moody’s has assigned an Aa3 rating to both the County’s 2018 bonds and the state’s intercept program. Annual debt service is expected to be about $14 million to $19 million. The new criminal justice center is expected to be completed in 2022. The terms of the deal require Detroit-based Rock Ventures, part of the Quicken Loans Family of Companies, to build a new $533-million criminal justice center, providing the County with four state-of-the-art buildings as a solution to its long-stalled Gratiot jail project in downtown Detroit. The newly constructed criminal justice center will house the County’s 2,280-bed jail, sheriff and prosecutor staff and administrative offices, criminal courthouse, and juvenile detention facility. The County will invest $380 million in the project with Rock covering the remaining costs and any overruns related to the construction of the criminal justice center. In addition to the $315 million in new bond proceeds, the County will use approximately $55 million in remaining bond proceeds from the unfinished jail project at Gratiot and general fund dollars to come to the $380 million total. In return, Rock Ventures plans to build a mixed-use development valued at up to $1 billion on the failed jail site and neighboring parcels. 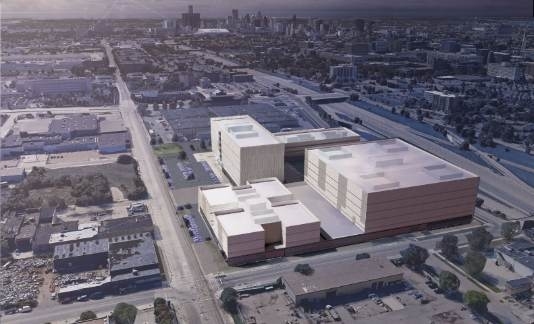 The failed jail site at I-375 and Gratiot offers around 13 acres of space. In addition to that parcel, which is now being demolished, and four neighboring buildings, Rock Ventures plans to renovate the former Detroit Police headquarters at Macomb and Beaubien streets that was built in 1923. The U-shaped, eight-story building designed by famed architect Albert Kahn will likely be converted into a hotel. Rock’s plans for the entire project have yet to be announced, but will including office space, residences, stores, restaurants, a hotel, and parking.